Adventure collides with tourism on a high-alpine bike ride through the Andes. High in an isolated corner of the Peruvian Andes, we stood slack-jawed atop a plateau amidst a throng of people dressed like they’d just stepped off a tour bus. That was because they had just stepped off a tour bus. Though our surroundings were breathtakingly beautiful, the sheer number of humans sharing the experience both shocked and subtracted from its charm. Below us, hundreds hiked upwards in our direction. It was a stark contrast to the previous four days of alpine travel in which we’d only seen a couple of native Quechua herders, a few thousand alpacas, and a random dog that followed us for three of those. We shouldn’t have been surprised. Steve Storey, Michael Sousa exploring after a storm passes through our camp on first day. The Rainbow Mountains of Peru—Vinicunca for “seven colour mountains” to the Quechua—have hit viral status. Created over thousands of years as sediment layers laced with different mineral deposits that were turned on their sides by tectonics, uplifted, and exposed to atmospheric chemistry, they’ve been tagged as one of National Geographic’s 100 must-see places on the planet. With social media now the source of many people’s travel and adventure inspiration, it’s to be expected that formerly hard-to-reach places will become busier. But what does it mean? A few short years ago we would have been hard pressed to find anyone here. And we can thank climate change for the current situation: only recently did the ice encasing these mountains melt away enough to reveal their multi-coloured stripes. And what once required a lung-bursting six-day trek to see, has been shortened—through recent construction of a road—to a four-hour walk from a parking lot. Vinicunca can now be checked off the bucket list in a day tour from Cusco, Peru’s tourism hub. Has humankind’s constant drive to find an easier way to everything stripped the adventure from such places? Are we in so much of a rush to see things that we don’t actually experience the most memorable parts of a trip? We’d soon find out. The author takes advantage of a sweet downhill with Ausangate in the background. Like many others, Justa Jeskova, Michael Sousa, and myself discovered Vinicunca on social media. Their vibrant colours and other-worldly appearance called to us so strongly that we hastily convened a plan to film an attempt to reach them via mountain bike over the undulating high-alpine of the Andes. Justa’s research turned up ancient Inca trekking routes, allowing her to map out a course around southern Peru’s highest peak, Ausangate, with an out-and-back option to Vinicunca from the last camp. It would be an ambitious journey of 90 kilometres over eight days, requiring the crossing of seven passes between 4,750–5,250 metres. We’d originally planned for an unsupported trip, but after calculating how much food and shelter we’d need to carry on top of camera gear, that seemed unrealistic. With the first blasts of winter already dusting the high country, we played it safe, hiring a pair of local Quechua horsemen to help carry gear. We would be moving slowly, shooting various lines and trails along the way while the horsemen headed directly to each next camp. Born and raised in Tinki where our journey would begin, the father-son duo represented a pastoral society that had existed almost unchanged for hundreds of years. With receding glaciers and new roads into the area, however, this historical existence was now under threat. At 4,200 metres, Tinki sat at the lowest point of the trip. Looking to make our first day a short one in order to have maximum time acclimating at elevation, we didn’t depart until midday, our lungs grateful for those few extra hours. After loading the horses with food and supplies, we pedalled up toward Ausangate. Ominously, lightning from an early winter storm lit up the foothills around us; we were pushing our luck starting so late in the season. Alpacas rule the Ausangate landscape. After an hour of climbing, the clouds parted to yield brief glimpses of mighty Ausangate, thrusting sharply from the earth to over 6,000 metres, adorned in thick, craggy glaciers. Having spent the majority of my life in Whistler, British Columbia, where mountains and glaciers are commonplace, Ausangate nevertheless instilled a new level of jaw-dropping intensity—so massive and imposing it was as though I’d never seen mountains before. At that moment, I knew the trip would be a life-changing experience. And by the expressions on Justa and Mike’s faces, I knew they felt the same—though they might have just been trying to catch their breath. Waking to a crisp morning and the longest day on bikes yet—the out-and-back to the Rainbow Mountains. Our first 12 hours on the trail were an eerily accurate indication of the days and nights to come. An afternoon storm moved in to drop a fresh blanket of snow, then, as fast as it had arrived, cleared off again to reveal an even more beautiful Ausangate, this time backlit by a setting sun. Temperatures plummeted with the blackness of night, in which was unveiled a canopy of stars unlike anything we’d ever witnessed. Each day became more physically demanding. As the difficulty grew, so did the wear on our bodies. Faces succumbed to sun, wind, and biting rain. With lips chapping and noses peeling, we began to bear the look of our harsh surroundings. Storey and Sousa find a way to beat the crowds at the Rainbow Mountains. We gasped for air with each pedal stroke, and hike-a-bike’s felt like death marches. But we were rewarded two-fold for any discomforts: every climb was followed by a high-speed descent through a vast alpine bowl. Ridges and rollers of perfect red volcanic dirt stretched ahead like a massive playground in which we could freeride where we pleased. If there was a mountain bike version of skiing powder, this was it. worsening each day to the point that it almost ended his time on the trail; he’d completely lost his appetite and spent most non-travelling time in his tent. Before it got dangerous, however, he pulled through, continuing on after spreading his gear among us and the horsemen. A Quechua family living at 4,400m. The region’s Quechua herders, of course, were inured to altitude and amused by our trials. A rare group living in one of the few remaining pastoral societies in the world, their lives have changed little over hundreds of years. Clothing, food and fuel in the form of dung were all sourced from the herds of alpacas they still relied on. Their shelters blended into the landscape. Built of rock and soil, we passed many without realizing they were even there. For the Quechua, life was lived outside and shelters were solely for storage and sleep. While essentially serving the same purpose, our camps stood out much more, often set near a stream or lake, or just far enough back from the base of a glacier to remain safe from the constantly tumbling debris. It was a simple set up—two sleeping tents and a dining shelter to keep our food from blowing away. While our camp set-up was nothing special, our backyard view was always the stuff of dreams. Arfo, the three-day friend who was at our tent door each morning. At one camp, a herder’s dog had decided to curl up next to our tent. When we awoke in the morning and zipped open the fly he happily joined us inside. We assumed he would have the indifferent mentality of a working dog, but he was incredibly friendly and affectionate. He subsequently followed us for three days, lazily making his way across multiple passes. Having spent a good chunk of our trek with him, we decided to nickname him Arfo. Unfortunately, Arfo soon swapped us for new friends who traded for his loyalty with treats. Our horse packers were men of few words. They took great pride in their animals and work, and a lifetime living at altitude had delivered the ability to survive in the thinner oxygen levels. The elder proudly wore colourful, hand-woven hats while his son dressed much more modernly, a sign of the region’s changing times. Since they moved ahead of us so quickly, they didn’t witness any of our descents over the first few days and we could tell they were wondering what the hell we were up to with our bikes. When they saw their first descent—us navigating our way down a steep, boulder-strewn bowl to camp—they seemed impressed and offered up a round of applause. A child in Pacchanta, a small community at 4,300m. As sublime as the riding was, our most memorable moment was meeting a young Quechua girl in the middle of nowhere. We’d ascended a 5,000-metre pass and had just barely begun rolling downhill on the other side when we came across her. With the nearest village several kilometres below, finding a child completely alone on the side of a cold and desolate mountain was surprising to say the least. But she sported an adorable smile and big, sparkling eyes. Conversing in Spanish, a second language for both of us, I discovered she was out of school for the day and had climbed up the mountainside to play—in flip-flops no less—demonstrating the hardiness of the Quechua. Meanwhile, we continued to struggle for breath. With three gruelling days behind us, we reached our last camp before the out-and-back to Vinicunca. Along the way, we’d rushed through incredible terrain past stunning vistas in order to stay on schedule, the excitement of making it to our goal overshadowing any momentary regrets about not lingering in the landscape. Because the following day would be our biggest—a 20-kilometre roundtrip with three passes over 5,000 metres—we planned on waking well before sunrise to allow enough time to make the return trip before dark. It would be a long, difficult day. A Quechua woman weaves her own textile rainbows. We began our first ascent as the rising sun started to melt the snow that had fallen overnight. The first pass, a steep and exposed hike-a-bike, reminded us of where we were and just how difficult the rest of the day would be. An hour later, cresting the top, we caught our very first view of Vinicunca. Even from a distance it looked incredible. The mountain’s coloured stripes popped vibrantly, with alternating hues of ochre, red, and turquoise. Just as breathtaking were the 360 degrees of scenery leading to its flanks, mountain upon mountain of lush greens and volcanic reds. Around midday we turned the final corner to Vinicunca. At first, we only noticed a small group of people in the distance, but as we moved closer, more became visible. Then, as a full view of the Rainbow Mountains coalesced, hundreds materialized—a steady stream of tour groups, a sea of selfie-sticks and people clad in street shoes, jeans, t-shirts, and tights ascending from the opposite valley. After travelling so far over such challenging terrain to behold these geological wonders, it was a shock. When Vinicunca’s popularity boomed, demand to find faster and easier ways to see them skyrocketed in tandem.Tour operators were duly rewarded when a newly discovered route and road allowed just that. After having spent four days mostly alone in some of Peru’s most beautiful high country, it could have been anticlimactic to arrive to such a crowded scene. But we had our bikes as a means of escape. We found an area away from the crowds to freeride some ridgelines. Each hike back to the top was a contemplation of the tiring journey required to get here. While a big effort to reach Vinicunca didn’t necessarily mean our experience was any better than someone who took the new, well-trodden shortcut, it had certainly allowed more time to appreciate where we were, as well as the highs and lows of alpine travel. We all agreed, however, that even we’d been in too much of a rush; in our haste to reach Vinicunca, we hadn’t truly absorbed the spectacular scenery. Storey and Sousa beside Ausangate. With the beauty of Vinicunca and joy of accomplishing our biking goal etched on our brains, we began the return journey to camp where the horsemen and a well-deserved rest awaited. As it turned out, the ride back to our starting point would be just as memorable as Vinicunca itself. We took the next three days a bit slower. Each break became a little longer, giving more time to view our surroundings—and let the pain of each lung-gasping kilometre sink in a little more. We probably could have kept moving, but there was no longer an established timeline to our next destination. Our new schedule was to experience the moment. Hired local horseman prepares a load for the eight-day trip. Vinicunca, or the Rainbow Mountains, are located about 80 kilometres southeast of Cusco near Ausangate (6,348m), Peru’s fourth-highest mountain. Part of the Andes range formed 24 million years ago by subduction of the Nazca plate beneath the South American plate, Vinicunca is situated in the subrange known as Cordillera Vilcanota (house of the sun). The rainbow colouration in the stratigraphic layers is due to the different environments and mineralogy of each layer that prevailed when the sediment was originally deposited, the conditions under which it was altered into rock, and subsequent weathering. Storey and Sousa pass a small, high-alpine village. My favourite day of the whole journey involved a trip up to 5,250 metres followed by the longest, highest-speed descent of our trek. Being at an altitude where humans can’t survive for extended periods was humbling. Reaching it on bikes, then racing downhill for what seemed an eternity, was nothing short of magnificent. We traversed back and forth along the mountainside through herds of alpacas, stopping every so often to look around in gratitude. It didn’t hurt that the alpacas had created singletrack as fun as anything we’d ridden anywhere in the world. A final day saw us through all the beauty that Ausangate could muster. We were also overcome by the strongest mountain storm any of us had ever experienced. Summer turned to winter within minutes. Drenched and pelted with hail, we nevertheless enjoyed the drastic turn. In the final few kilometres, we escaped the storm, riding into the village of Pachanta under a sunset golden enough to warm our chilled bodies. Greeted by the local children with hugs and high fives, we watched as they rode our bikes in endless circles, providing a soundtrack of laughter while we celebrated with our first beers in nine days. Our feet and hands had been perpetually cold and wet, our skin burnt and cracked, our heads pounding and swollen. But none of it seemed to matter in the face of climbing those magnificent passes, railing forever downhills, or witnessing Earth’s alpine tantrums—crumbling glaciers and ground-rumbling rock slides. Had we chosen the easier way to the Rainbow Mountains, we would not have experienced any hardship at all. In the end, taking the time to do so left us feeling both fulfilled and enriched. Social media may have caused a scramble to see places like Vinicunca, but beyond the growing crowds, selfie-sticks, and jostling tour operators, know this: there’s still a world of adventure to be had out there… and more than enough room to have it. From the 2017/18 Mountain Life Annual, available on newsstands or through our online store now. .Mountain Life Annual is a once-a-year, one-of-a-kind ode to nature-minded folk who seek an honest, intimate connection with planet Earth. Going beyond the typical bravado of outdoor pursuits, “The Annual”—as many call it—is a visual and journalistic celebration highlighting the cultural, political and environmental contexts behind most great adventures. Valuing inspiration over aspiration, The Annual promotes personal connection and deeper resonance in an expanded understanding of the environments we love—and those we wish to protect. Hopefully you’ll be as delighted as we are with our fifth edition: Mountain Life Annual 2017-2018. 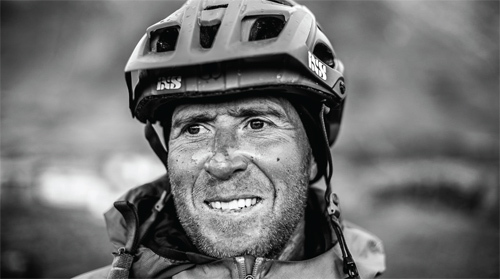 Whistler resident Steve Storey is a mountain biker, trail builder, skier, surfer, and traveller. When not enjoying British Columbia’s bountiful backyard he can be found wandering the globe in search of burgeoning riding scenes and new places to surf and explore.